Also, if any one is interested, I have been asked by the organisers of a tour of Sweden and Norway to publicise their tour. It is from May 18 - June 1 2006. Entry is restricted to the first 50 cars so if you are interested in taking your Y - please call Ian on +44 (0)1824 790280 or email him here for more details. Of course if you go, there will be some stunning scenery and it would make for a very interesting report on the site too so take your camera please! Brian and Christine Calder have sent in a new photograph of Y 3095 for Ys on Parade. A while ago the two of three of the original artworks as used in the Autocar's review of the MG Y dated 9 May 1947 was acquired. At the time an interest was expressed by some owners for a copy of these. They are now available on the Reprinted Articles page. Today, please welcome Ian Thomas and YT 4714 to Ys on Parade. Flicking through the Classic and Sports Car Magazine for October 2005, there is a report on pages 164 - 165 on the MG Car Club Silverstone meeting earlier this year. 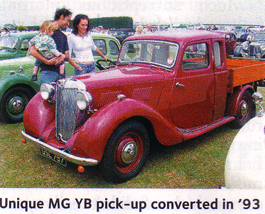 Although the editor missed a fantastic opportunity to comment on the fabulous turn out of lovely MG Y Types there in his commentary, he did at least take this picture, and print it, of Andrew Coulson's MG YB pick up conversion. You can read more about this car here, and you can read more about the Silverstone Weekend - with a special emphasis on Y Types here. A new technical advice note on Brake shoe liner replacement has been added to the Technical Advice page. It's time for the mid-month magazine Reproduced Article, and for those of you who were wondering what the German article released earlier this month said, now is your chance to find out. Remember the rally going MG YB from Holland on Interesting Ys? We have some more information on it from the owners so check it out again. Hopefully sometime we will be able to add more to the detail of this amazing car. It is a year since the last update to the YT Factory Production Records. Total Cars identified as 'Confirmed Survivors' is now 163, that's 13 more than last year. Only two of these were on the thought to have survived, the other 11 are new. A new YT Factory Production Records file has been supplied by David Pelham and is now available for downloading. Mike Lyons has sent in an update to the photograph and description of his Y 6594. The article Mike refers to will be published in January 2006 on this website under our Reprinted Articles page. Please welcome Graham Loader and Y 1201 to Ys on Parade. Pat Keily used to have an MG YB back in the 1960's and would like to know what happened to the car. The car is not currently known of on our database so we have added it to the Lost Ys page. If you can help, please contact the Registrar who will pass on your details. 84 more days to Christmas - perish the thought! Jumping straight in this month is Tony Stock with another great picture onYs at Weddings - with 2 YTs! Also, a new Picture of the Month for your enjoyment. Continuing from last month, we have another foreign language article again from an article in a German magazine Reprinted Articles! The English translation will come in a few weeks time, so watch out! As an interesting aside, since we began offering Technical Assistance through the Technical Advice page (available from the Menu under Technical Centre) the information contained and available from our site is now so great that owners of other MG models, and indeed other makes too, are referencing it on a regular basis!